I was debating between 3 and 4 but, you know me; even the slightest hint of sentimentality or people being decent to each other and down goes the grade. I’m being slightly facetious here. I like nice people who don’t hurt others; I just don’t like when films tell me to be a good person. With that said Panic in Year Zero is a very entertaining “self preservationist”, end of the world movie. The obvious influence is Roger Corman’s 1956 film The Day the World Ended but clearly the post-apocalyptic theme is pretty common in science fiction these days.Back then, however, with atomic fear right around the corner, the film was also very topical. Also, it should be known, that I love cold war cinema a lot! A lot lot! I love watching Commies invade the U.S. and watch people fighting back. And I know, it’s not politically correct to say this but I love anti-Commie propaganda. I don’t believe it, mind you. I just enjoy watching Jack Webb telling you how to spot a Commie. But I especially love atomic bomb mushroom clouds that result in gross mutations. 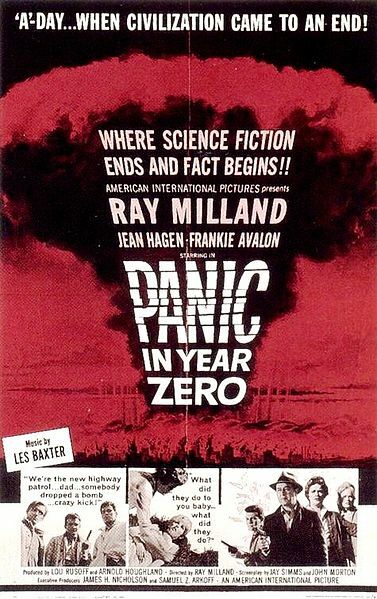 Panic in the Year Zero is a very entertaining movie from actor turned director Ray Milland. 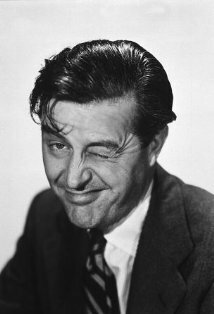 Ray Milland is great! He’s hammy as all hell and old fashioned but so much fun! How fun you ask? Look at his IMDB photo! The story begins when a fishing trip is cut short by several hydrogen bomb blasts that set L.A. ablaze and set the L.A. area’s population into panic. Thinking on his feet Harry Baldwind (Millan) leads his family, consisting of Rick (Frankie Avalon) the son, Ann (Jean Hagen) the wife and Karen (Mary Mitchell) the daughter, to a cave hideout in some far away town, where they fend for their lives. On their way they pick up supplies and fight with people. 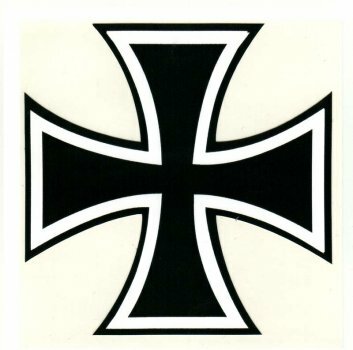 Among those who they fight are various local folks who are also fending for themselves and a trio of juvenile delinquents turned homicidal maniacs and rapists. Basically the film’s premise exists on the fact that in situations such as these, we are forced to fend for ourselves and not care for others. The film’s entire moral crux is displayed in this exchange, following Rick’s almost nailing one of the delinquents, Carl (Richard Bakalyan, who plays in The Delinquents if you can believe that!) and then says, “but Dad, I could have blown his head off!” In response Harry says, “you’re not supposed to like killing people! You’re just supposed to do it for self defense!” Right on, pops! Indeed the majority of the of the good stuff is given to Milland and Avalon. Unfortunately the female characters are entirely one-dimensional. Ann, the wife/mom is constantly trying to derail their progress under the notion that you’re supposed to be kind to people always. This got REALLY frustrating! The reason Avalon missed one of the thugs with his shotgun blast is because his mom pushed his gun away! I was ready to reach into the screen and strangle her! What are you thinking, lady? Are you TRYING to get your family killed? The daughter on the other hand just functioned as scenery; her only purpose was to be raped by one of the thugs only to be avenged later. I suppose that would count as a spoiler. Fortunately the wimpy female is balanced by a strong female character who can shoot guns, whew! Milland might almost have been branded a sexist! Her name is Marilyn and she’s played by Joan Freeman if you must know. And that about covers it.